The apparatus comprises a thick brass calorimeter approximately 90x65 mm. diameter, a bung with steam inlet and outlet tubes, a felt cover, and a 1100 cm3 tinplate boiler with bung to take the steam tube which a connects to the calorimeter. To furnish the diverse requirements of our clients in the best possible manner we are involved in offering an extensive range of Regenerative Heat Exchanger Apparatus. - Feed Tank Material Stainless Steel, Capacity - 20 Ltrs. - Feed Circulation By compressed air. 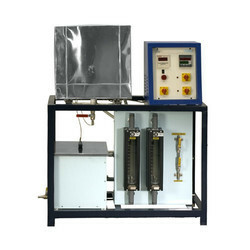 Plate Type Heat Exchanger Apparatus and Training System, technical teaching equipment for engineering. This equipment is required to determine the heat of hydration of cement as expressed in calories per gram. onstant pressure can be calculated. To observe radial & axial flow heat conduction. To determine Radial & Axial thermal conductivity of test speciman . To observe and plot the temperature distribution along the length of the speciman. Heat Of Hydration Test Apparatus. As Per IS 4031 (Part IX) - 1988. Used to determine the heat of hydration of cement as expressed in calories per gram.AIC-HHT-DTH01. : HEAT OF HYDRATION TEST APPARATUS. 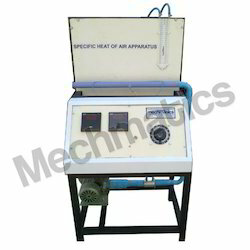 In General Heat Apparatus temperature varied from ambient temp to 70ºC i.e. below the melting points of wax. The temperature is thermostatically controlled. The body is made out of thick mild steel duly finished in white stoving enamel /powder coated paint with mat finished colour combinations and a top is made of the highly polished aluminium sheet. To work on 220V 50 Hz single phase.